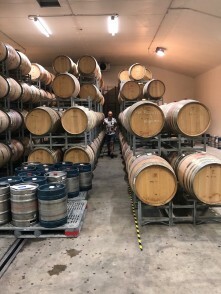 Deciding Defiance......we took the important step last week of deciding on the selection of barrels for the 2017 vintage of the Defiance Pinot Noir. 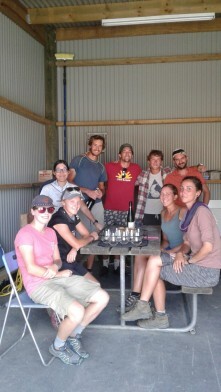 Pete Bartel, our winemaker, his assistant, and Graeme and Gillian undertook this important task. Our Defiance Pinot Noir grows on two blocks on our Defiance vineyard chosen for the quality of the soils and underlying gravels. We have five clones of Pinot Noir planted and each vintage the Defiance Pinot Noir can be selected from just a few or all of these. 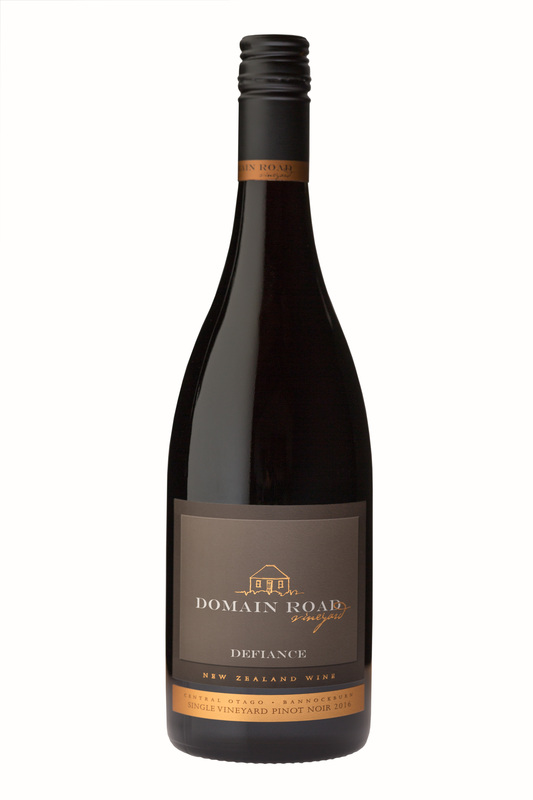 Our first Defiance Pinot Noir, the 2016, in its distinctive 'Grand Burgundy' bottle, was released just before Christmas, it is drinking well and receiving good reviews. So if you are in Bannockburn, why not pay us a visit and taste it for yourself!! Vine time deserves wine time!! 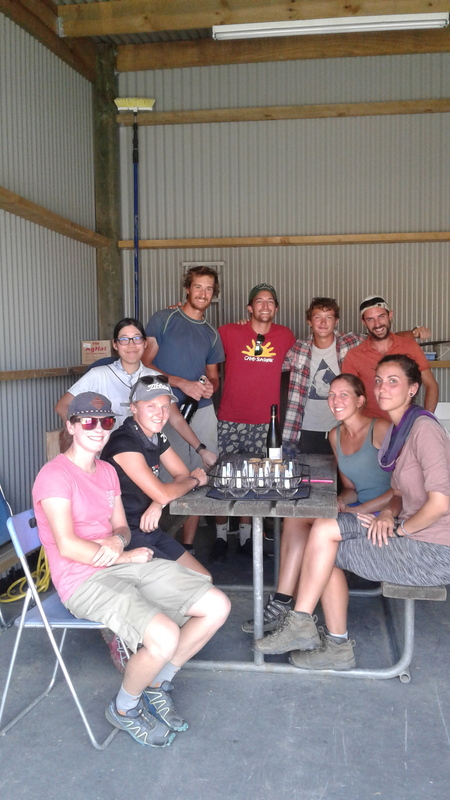 Fiona and her vineyard team have had a hot time in recent weeks, a string of 30+ degree days has meant working in the vines was very warm work. 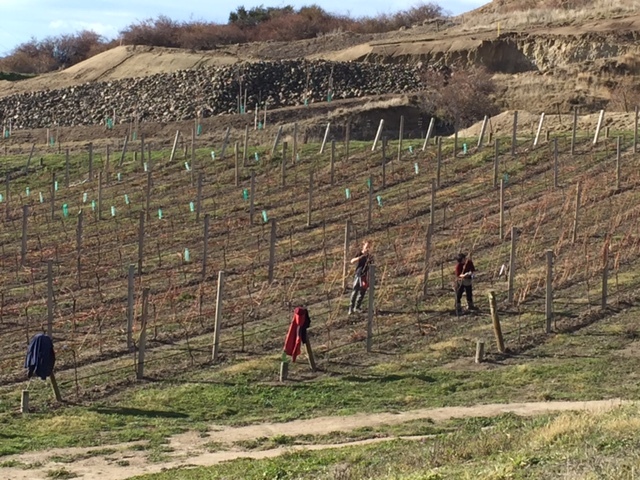 The team has also been much bigger than usual as the warm weather has required considerably more work in the vineyard over a short period of time. The team was as cosmopolitan as ever - Italian, French, Czech, Thai and American - the one thing that they all had in common was an appreciation of good wine!. We think everyone more than deserved a glass of wine to mark the end of the working week and to farewell some of their colleagues who were moving on to new adventures. Favourite this week a glass of chilled Riesling!! The vines are also finding the hot weather hard work, as a consequence of the warm weather (our temperatures have been about 2.5 degrees warmer that normal) we are about three weeks ahead of where we would usually expect to be at this time. 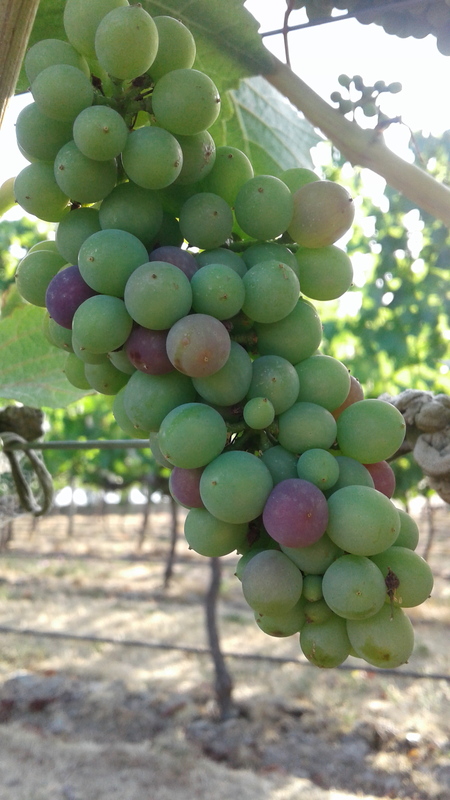 Veraison is well under way (veraison refers to the commencement of the ripening process including changing colour in the Pinot) and we will be looking to get nets on shortly as birds (Blackbirds in particular) can spot a ripe berry from 100 wing beats!! As it is again today - the tussocks have grown in the last year - and we have new planter boxes and a wine barrel to enhance the outside experience!! 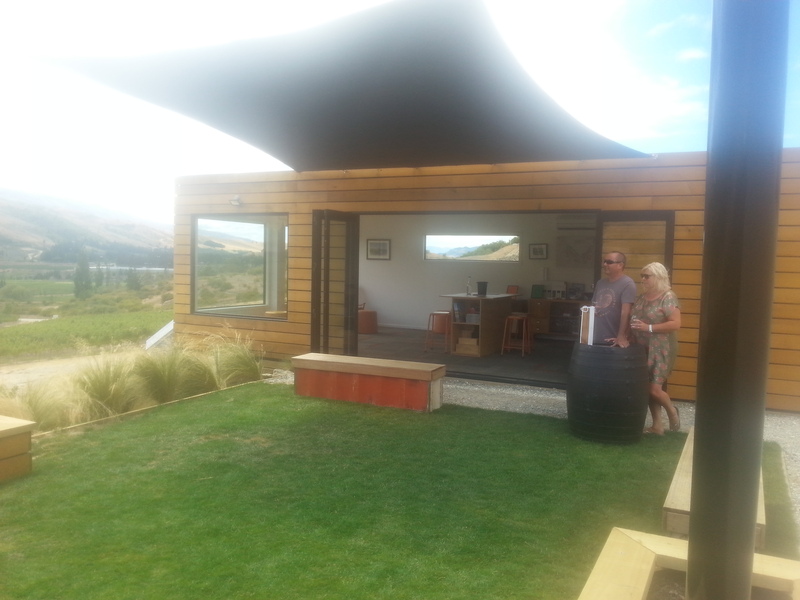 What an amazing year it has been, the tasting room continues to attract visitors from all over the world and our visitor numbers have doubled this year. 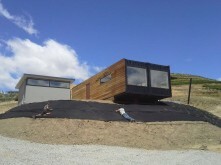 People are intrigued by the use of containers to 'build' the new tasting room and everyone loves the view! Opening over the winter for the first time has proven to be a success has as opening more days and longer hours. Being open over the winter also meant that, for the first time, visitors were able to see the work involved with pruning!! The view from here with snow on the mountains around us was stunning. 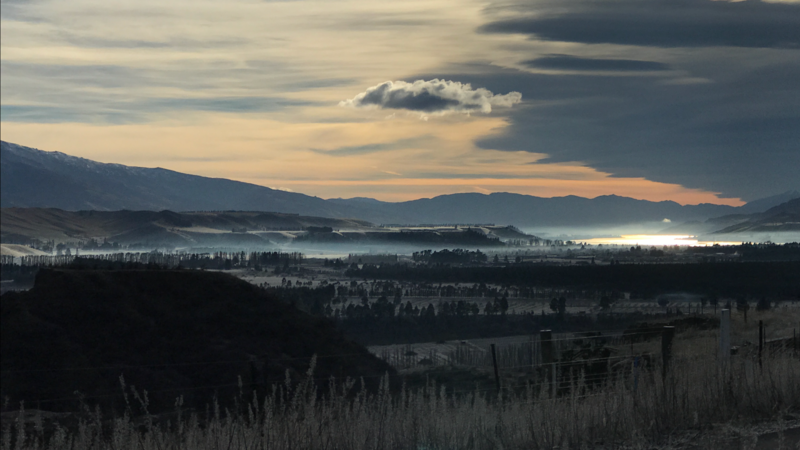 Winter Solstice from the tasting room was truly spectacular. 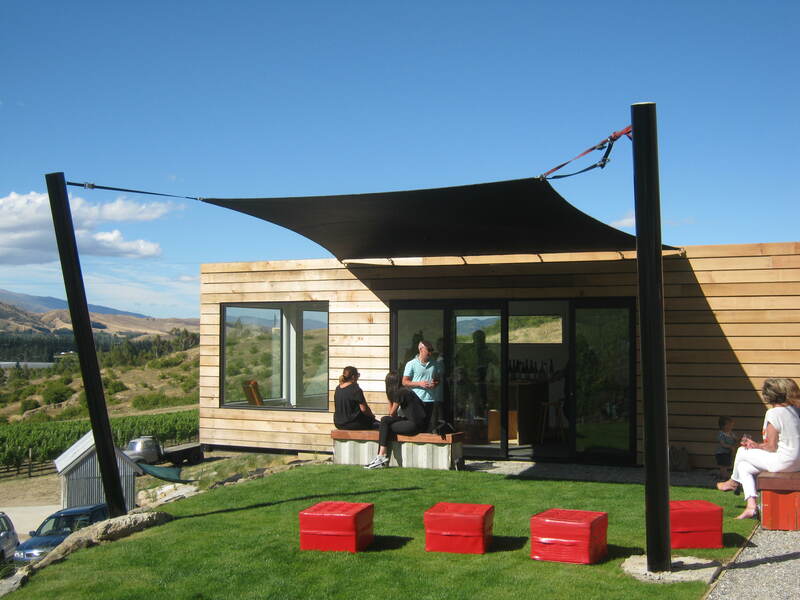 Another first for us this year is the release of the first single vineyard Pinot Noir from Defiance Vineyard - youthful, with all the exuberance of youth, Defiance is proving very popular with visitors. All of the wines that we are currently tasting have 4 or more stars - in fact six of of them have gold medals or 5 star ratings. So whether your favourite tipple is Pinot Noir, Chardonnay, Riesling or Sauvignon Blanc there will be something for you to enjoy - so please call in and see us if you are in Bannockburn. 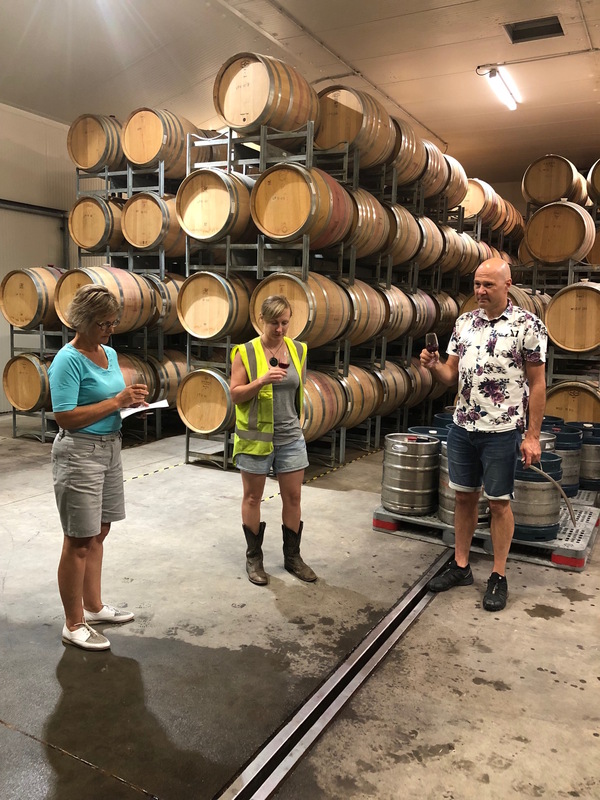 With the increased hours we now have more people at the Cellar Door, but Maria, Jim, Jacqui or Jennie will give you a warm welcome and be delighted to show you our delicious wines! !